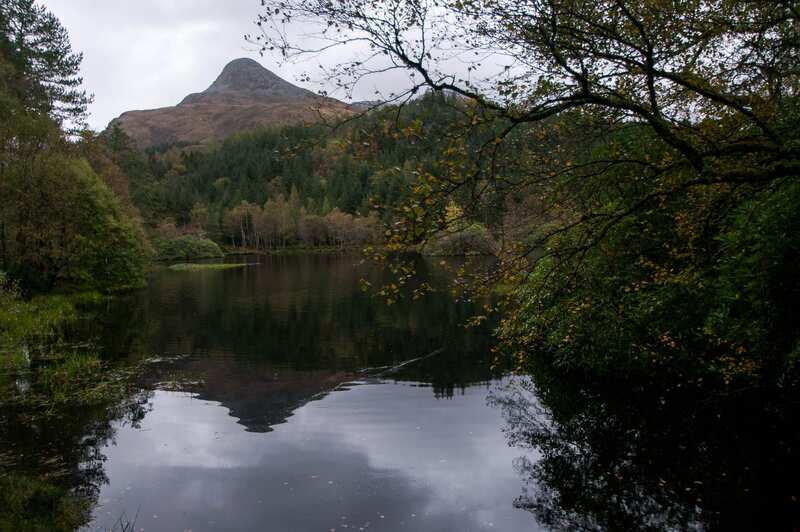 There are three different walks around Glencoe Lochan to choose from. All start at the car park and reward the visitor with delightful views of the lochan and surrounding mountains. Delightful location for a picnic. This is a real find if you are looking for a lovely walk with family or friends. You will find it by going over the River Coe Bridge just after Glencoe village. It has its own car park and there are three well marked trails to choose from – the red one is suitable for all including buggies and wheelchairs and has picnic tables and benches along the route. It’s a beautiful setting with the loch being surrounded by mountains and a forest of conifers. Take the blue walk which takes you up high and gives you the opportunity of getting great pictures over Loch Leven, Beinn a’Bheithir and the Pap of Glencoe.